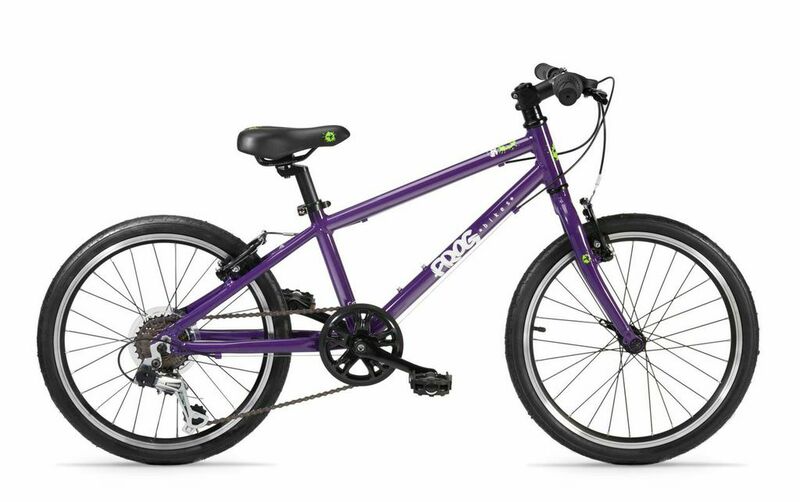 This updated spec has adjustable Tektro brakes, 8-speed Shimano easy-change thumb shifters and 8 speed cassette hub. 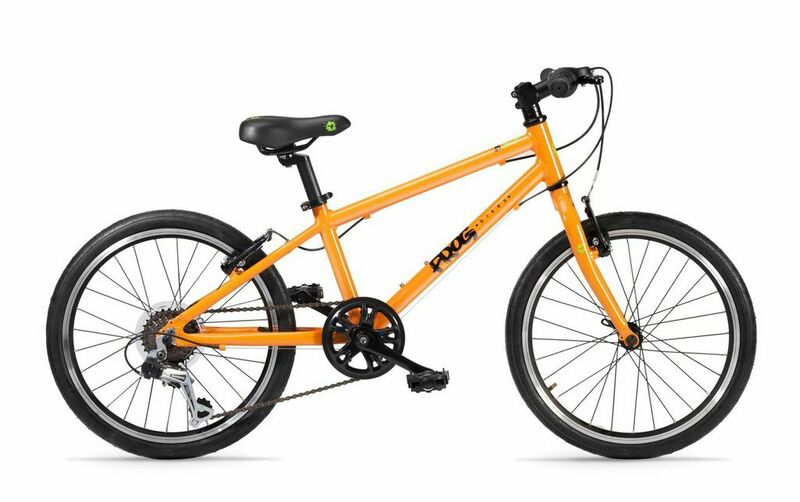 The all-aluminium bike has a high quality frame, easily adjusted saddle height and now a shorter crank length of 114mm. Its hybrid tyres are suitable for road and off-road use. Available in red, purple, orange or spotty, and comes with a bell, reflectors and mudguards as standard. 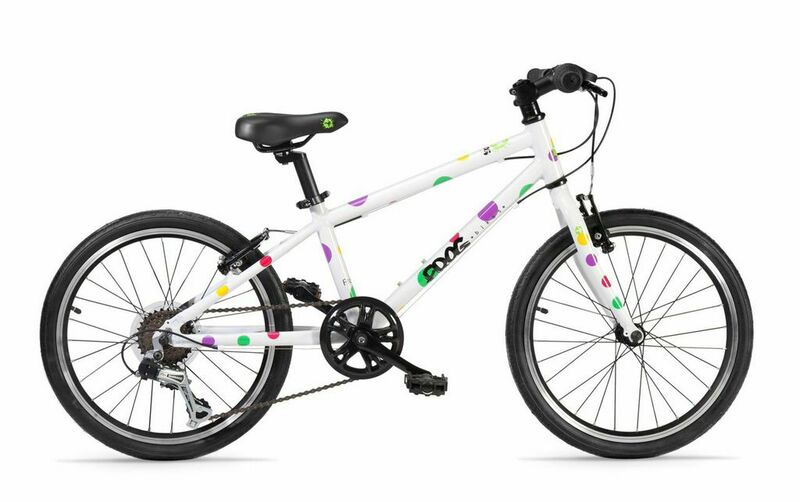 Suitable for minimum inside leg of 55cm (around 6-7 years old), it has 20" wheels. Free 5 year warranty available on the frame and forks, 2 years on all other parts. Colour: Red, Purple, Orange, Spotty, Union Jack, Green, Pink, Team Sky Black. Frame: Aluminium 11" Frog 55 Frame. Bottom Bracket: 110.5mm Sealed Bottom Bracket. Crank: 114mm Aluminium Black Crank. Chain Ring: Steel 32 Teeth. Chain Guard: Integral Black Double Chain Guard. Brakes: Tektro 836AL Aluminium V Brake Black. Brake Levers: Tektro Aluminium JL510-TS V Brake Lever Black. Length of Top Tube: 449mm (horizontal distance from seat post to stem: 474mm). Stem: Frog Bikes Aluminium 40mm Stem. Handlebar: Frog Bikes Aluminium Straight Handlebar Width 460mm. Grip: Frog Bikes Locking Slim Grips. Saddle: Frog Bikes Saddle Size:201*136mm, Black, adjustable rails for better fit. Seat Post: Aluminium 250mm, 27.2mm wide, Quick Release. Pedal: Plastic with Ball Bearings and Reflectors. Rim: Aluminium 20" x 1.5" 28 holes Black (Weight:320g) and Quick Release for easy removal of wheels. Tyres: Kenda 20" x 1.5" hybrid tyres. Tubes: Kenda 20" x 1.5" with Schrader Valves. Right Hand Gear Shifter: SLM360 Alivio 8 speed Right Hand Gear Lever. Rear Derailleur: RD-FT55- Direct 8SP. Cassette Hub: Shimano CS-HG200-8 11-32T. Reflectors: White & Red front & rear reflectors, 2x wheel reflectors (in both white and orange). Mudguards: Plastic Mudguards front and rear. Frame Protectors: Clear stickers for chainstay and frame.